In the years between 1880 and 1950, Americans recited poetry at family gatherings, school assemblies, church services, camp outings, and civic affairs. As they did so, they invested poems—and the figure of the poet—with the beliefs, values, and emotions that they experienced in those settings. Reciting a poem together with others joined the individual to the community in a special and memorable way. In a strikingly original and rich portrait of the uses of verse in America, Joan Shelley Rubin shows how the sites and practices of reciting poetry influenced readers’ lives and helped them to find meaning in a poet’s words. Emphasizing the cultural circumstances that influenced the production and reception of poets and poetry in this country, Rubin recovers the experiences of ordinary people reading poems in public places. We see the recent immigrant seeking acceptance, the schoolchild eager to be integrated into the class, the mourner sharing grief at a funeral, the grandparent trying to bridge the generation gap—all instances of readers remaking texts to meet social and personal needs. Preserving the moral, romantic, and sentimental legacies of the nineteenth century, the act of reading poems offered cultural continuity, spiritual comfort, and pleasure. 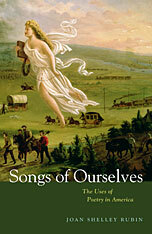 Songs of Ourselves is a unique history of literary texts as lived experience. By blurring the boundaries between “high” and “popular” poetry as well as between modern and traditional, it creates a fuller, more democratic way of studying our poetic language and ourselves.